With the announcement in January that the Baseball Writers Association of America had not voted anyone into the Hall of Fame recently, discussions once again began in earnest as to who was the greatest ballplayer ever. And now that spring training is underway, it seems like a good time to look back at times past as we also start to look forward to the upcoming season. There are those who believe Barry Bonds has to be thought of as that player due to the monster numbers he generated while "unaware" of taking steroids. There are many who maintain that Willie Mays was the No. 1 guy. But to be honest, I'm not sure why there's any kind of debate since there is only one answer: Babe Ruth. George Herman Ruth, Jr. was the most dominant player in the history of baseball. In fact, you could make a strong case that he dominated his sport in a way that no other athlete in any other sport has ever done. Not Wilt Chamberlain in basketball, not Wayne Gretzky in hockey, not Pele in soccer. Ruth arrived just as the game was changing, moving from small-ball to the home run era and Ruth led the hitting parade. But he wasn't just a home run machine. He was much, much more. It can hardly be overstated how much of an impact the Bambino had on the sport of baseball. He was a larger-than-life figure, a true superstar persona perfectly crafted for the Roaring Twenties. His international celebrity brought new and wide-ranging attention to the sport. But most importantly, he led the vanguard of ballplayers out of the Dead-Ball Era and into the Live-Ball Era. Hitting and pitching changed in the decade where he did his best work and his presence indelibly shaped that change. Everyone knows about the career total for home runs and the magic 60-homer season in 1927. But not everyone knows that in 1918 as a part-time right fielder, part-time pitcher, Ruth led the American League in homers, with 11, in just 95 games. Or that, the following year, he shattered the 35-year-old record for homers in a season with 29 while playing in just 130 games. Or that he almost doubled up again the following year as a full-time outfielder for the Yankees, hitting an unheard-of 54. And then outdid himself again in 1921 with 59. When he finally reached 60 in 1927, there was no doubt who the greatest power hitter in history was. But let's put that in perspective. In 1919, when Ruth hit 29 home runs, there were only 447 homers hit in all of the Major Leagues. Ruth's 29 dingers were six percent of the MLB total. In 2012 there were 4934 home runs hit in the Majors; six percent of that total, 296, is more than any one team hit (the Yankees hit 245). Jump ahead to 1921 when Ruth again broke his own home run record with 59; players throughout the Majors had begun hitting those hard, white balls with far more regularity than they'd ever hit the mushy grey balls of the Dead Ball era—937 bombs were hit that year, more than double what had been hit just two years earlier. But Ruth still hit six percent of the total. The fact of the matter is, while home runs became dramatically more frequent in the Live Ball era, they were nowhere near as frequent as we often tend to think. 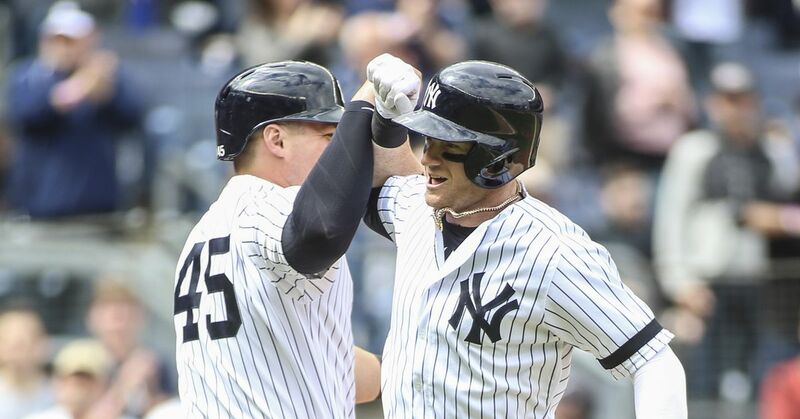 The Yankees led the MLB in home runs in that 1921 season, with 134, while no other team even got to 90; only five teams hit as few as 134 in 2012, with the average team hitting 164. The league average in 1921 was 59 home runs per team, the same number Ruth hit all by himself. Just on sheer power numbers, Ruth was so far ahead of the pack that there don't seem to be enough superlatives to adequately describe it. But there was more to the Bambino than just pure power. He was also a great hitter. Ruth's career batting average, .342, is the 10th-best of all time. He batted over .350 eight times, won a batting championship in 1924 with a .378 average, and hit as high as .393 in 1923, finishing second to Harry Heilmann's .403. In a game where making contact and putting the ball in play was still a prized skill, Ruth led the Majors in strikeouts five times, but never struck out more than 100 times in a season. Most modern sluggers would love to stay under triple digits in Ks. When people think of the Babe, they visualize a portly fellow living on hot dogs, whiskey and cigars. But he actually spent most of his career in pretty good shape. Baseball-Reference.com lists his playing weight as 215 lbs, which is not at all out of line for a 6'2" athlete. In fact, he was usually among the league-leaders in doubles, led the league in runs eight times, hit 10 or more triples in a season four times and stole 10 or more bases in a season five times. Admittedly, he ran much more frequently than would normally be considered prudent. In 1923, he stole 17 bases, tying a career-high. He was also caught 21 times that year, which is poor by any standard. His career stolen base totals are in fact just a hair better than a 50 percent success rate and it is often pointed out that Game 7 of the 1926 World Series ended with Ruth being thrown out at second on a steal attempt, giving Rogers Hornsby's St. Louis Cardinals the championship. At the end of the day, though, you can hardly call Ruth a liability on the base paths. His numbers paint a picture of a man who not only could run and score, but loved to run even beyond the level of his abilities. It's a bit of a challenge to evaluate a ball player's defensive prowess from Ruth's era due to some missing numbers but here is what we know. Ruth's fielding percentage in the outfield was .968, just a tick better than the .966 league average. He averaged a solid 11.3 assists per year, with as many as 21 in the 1920 season and putting him in the top five in the league seven times. He led the league in Range Factor twice, in 1924 and 1928. His career range factor of 2.07 is a little behind the league average of 2.35. Put all together, we can guess that Ruth had a little less range than his contemporaries, but made the plays he got to and had a plus arm. Considering the fact that he entered the Majors as a pitcher and had to play catch-up with his outfielding skills, this doesn't seem out of line. As a one-time pitcher, it also follows that he could throw with the best of them. If the rest of the evidence hasn't already set him apart from the competition, this is where he really pulls away from the field. Babe Ruth broke into the MLB with the Boston Red Sox as a pitcher. And not just some shlub either. In the five years that Babe was a regular part of the Red Sox rotation, he won an ERA title (1.75 in 1916) and was in the top 10 in wins and WHIP three times each. He finished his career with the 11th-best winning percentage of all time (.671), the 17th-best career ERA of all time (2.28) and 94 career wins. And he was even better in the postseason. In two trips to the World Series as a pitcher, he made three starts, won all three, and posted an insane 0.87 ERA. Along the way he set a record for longest scoreless streak in the World Series, going 29.7 innings without surrendering a run. That record would stand more than four decades until 1961 when Whitey Ford finally broke it. Had the Sox decided to keep the young Ruth on the mound, we might never have seen his potential as a hitter, but he almost certainly would have been a cinch for the Hall of Fame as a pitcher and probably would have won in excess of 300 games. Neither Bonds nor Mays ever threw a single pitch in an MLB game. Just sayin'. Babe Ruth changed the game of baseball. The power he displayed as a hitter was completely unheard of before him and still rare after he retired. It would be 10 years after Ruth smashed the 50-homer barrier that another player would get to that plateau, by which time Ruth would have done it three more times. Not until 1929 did all the top 10 home run hitters in the Majors reach the 30-homer mark and it would be the 50s before it became commonplace for 10 or more players to hit 30 in a season. Ruth hit 30 or better 13 times in a 14-year span. And he did it all while maintaining a stratospheric batting average and getting walked over 100 times per year and while providing solid corner outfield defense to the Yankees day after day. When you add in the fact that he was one of the top handful of pitchers at the start of his career, it becomes apparent that we're talking about a different kind of cat when we talk about the Babe. This was a complete ballplayer the like of which had never been seen before and will likely never be seen again. After helping the Red Sox win three World Series in four years, the Sultan of Swat turned the also-ran New York Yankees into the powerhouse everyone knows and loves to hate, winning four more Series along the way. There is absolutely no doubt in my mind that Babe Ruth was the greatest of all time. Baseball offense before him and after him are almost two completely different games and Ruth was the man who made it happen.